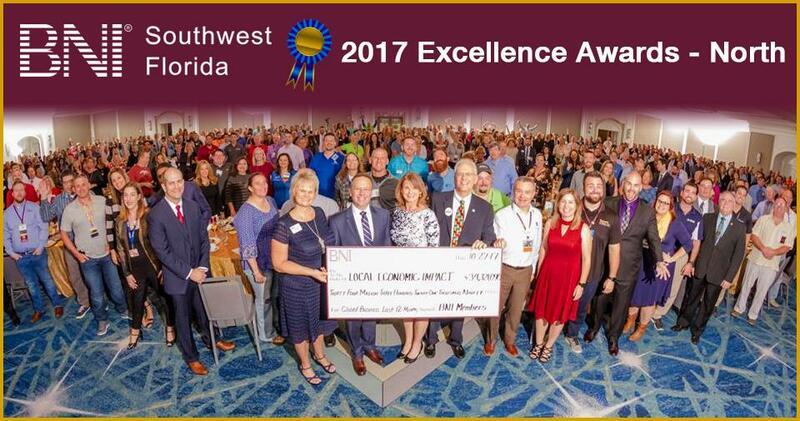 For the sixth year in a row, BNI SWFL has remained in the top 10 percent of all the regions in the WORLD! 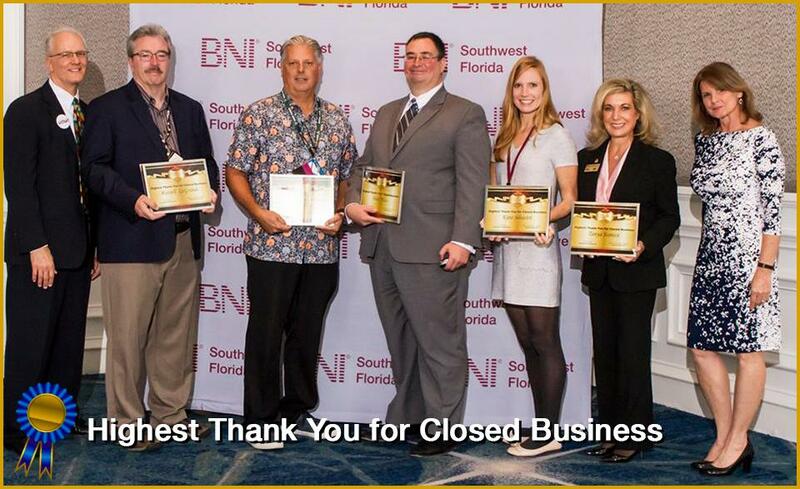 In the past 12 months, Southwest Florida passed over $68 Million in closed business amongst its 1500 members, almost $35 Million of that was generated for members in Charlotte, Sarasota and Manatee Counties! A record crowd of 650 gathered to celebrate and recognize the accomplishments of members and chapters over the last year. Congratulations to the this years 5 year members. 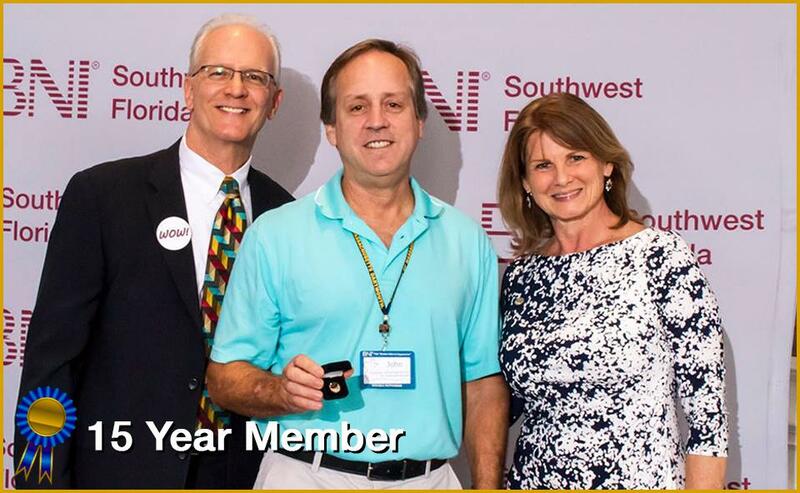 Congratulations for achieving 15 years as a BNI SWFL member. Director Becky Brantner with Purple Monkey Print and Design presented our third year of Education Equals Excellence Awards, or as we refer to it, E Squared. To qualify for this award a member needs to have attended all 5 of the Advanced Training Modules. This year we have 25 members who have completed all 5 modules. 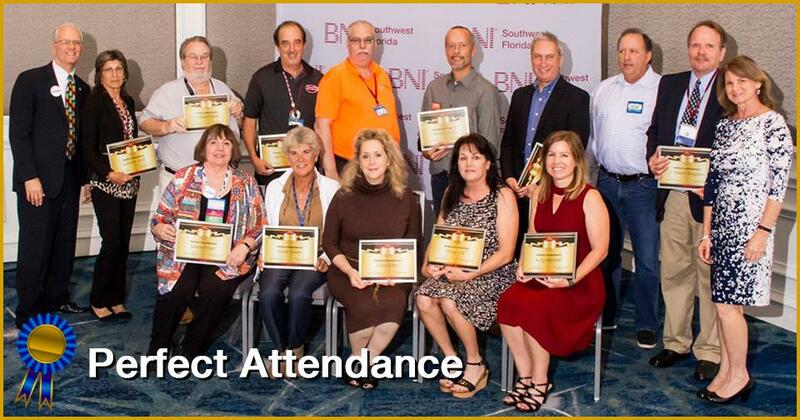 Director Robert Lauser with Grim Reaper Pest Solutions announced the 15 winners of the Perfect Attendance award. Members must have been a member for the entire year from October 1, 2016 to September 30, 2017. These members did not miss any meetings, were never late, had no medical and did not have a sub. Ambassador Paul Jorgensen with Farm Bureau Insurance recognized the top members who invited the most visitors to their chapter. 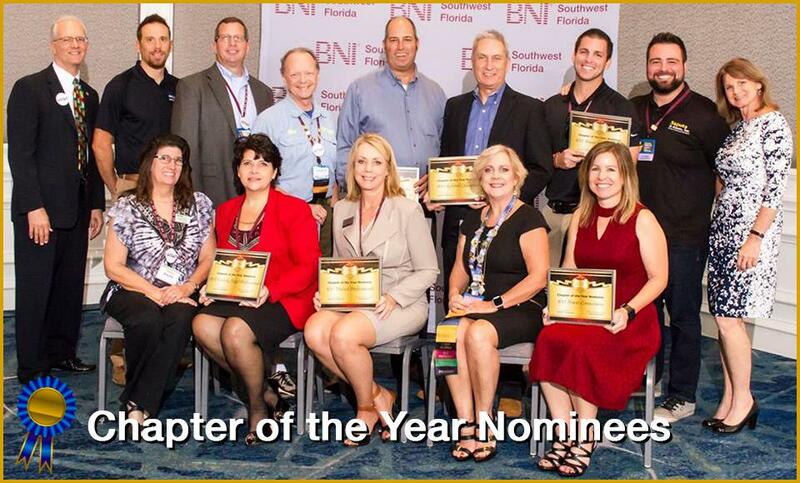 These Members, who have worked very hard to help their chapters grow and its referrals increase, are vital to their chapter's success. The following members have gone above and beyond, and their chapters are lucky to have them! 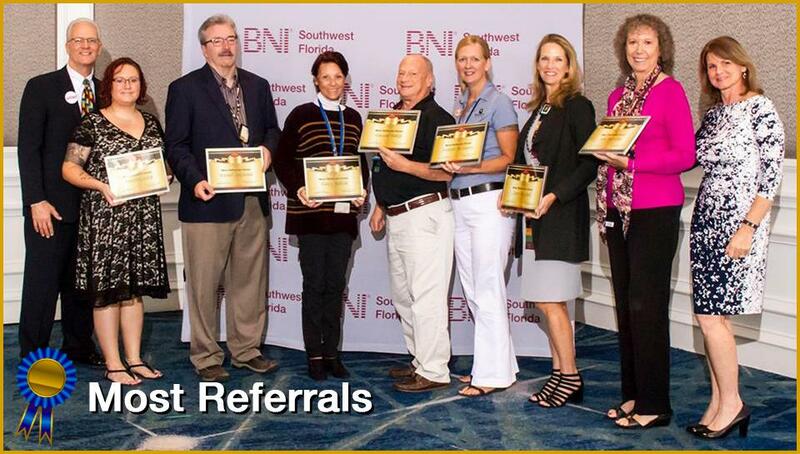 Director Mark Miles of Law Offices of Marc J Miles, PA announced the top seven members who passed the most referrals to their fellow members. Director Consultant Glenn Scharf with the Scharf Group announced the top five members who passed the most Thank You for Closed Business to their members. This is the epitome of Giver's Gain®. Most of these members will tell you that the ability to have reliable people they can refer their clients to is just as important as the business they receive. 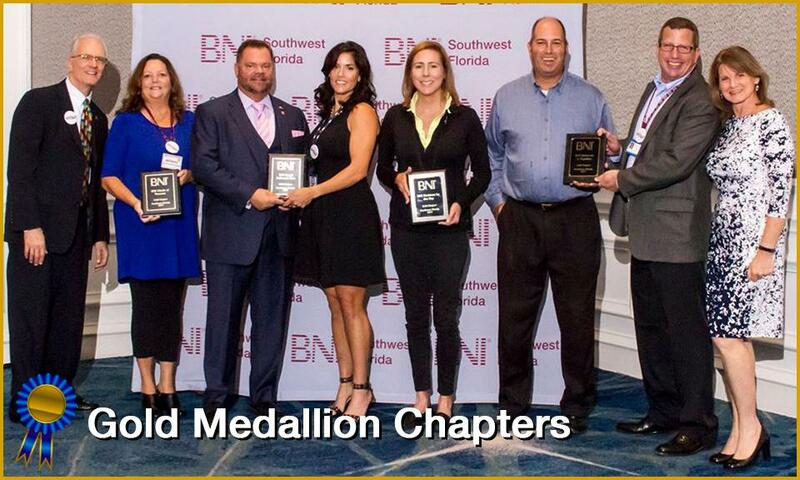 Ambassador Nimie Gill with Suncoast Web Marketing and Director Randy Corywell of WRC Associates announced this year's Medallion Chapters, recognized based on the number of members in the chapter. Chapters needed to maintain their size for three consecutive months from July 1 to October 1, 2017. Director Consultant Randy Coryell with WRC & Associates announced this year's Platinum Presidents. To qualify, Presidents participated in weekly calls with their director, attended monthly Roundtable or had representation, ran the meeting according to the BNI Agenda and deomonstrated Leadership Skills that resulted in success during the year. Director Glenn Scharf with The Scharf Group announced this year's Platinum Presidents. To qualify VP’s proved to be organized, and effective in managing and maintaining the Membership Committee. They entered and audited PALMS reports in a timely and accurate manner. They had open communication with the Membership Committee, Chapter Members and their Director. Along with the Membership Committee, they demonstrated skill and diplomacy in handling situations that arose within the chapter. They also displayed a positive attitude. 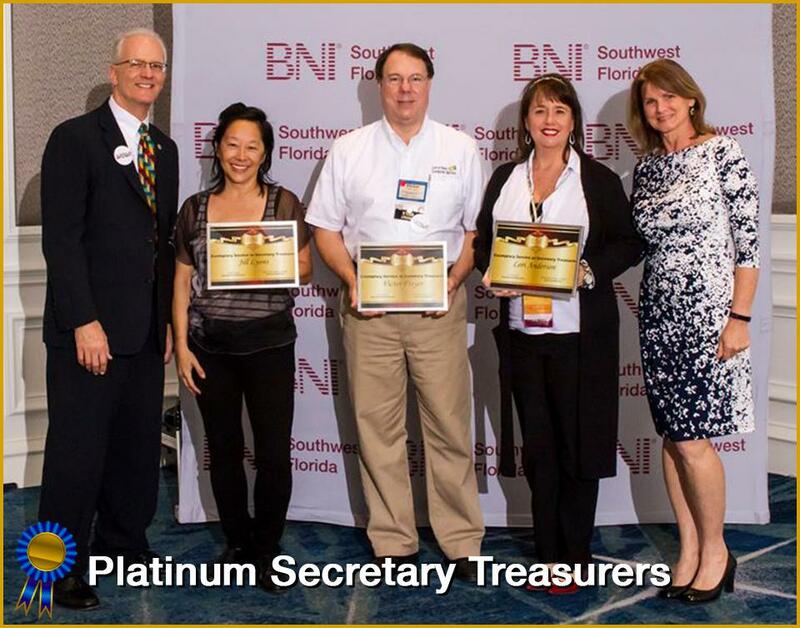 Regional Administrator Nadine Schleicher with announced this year's Platinum Secretary Tresurers. 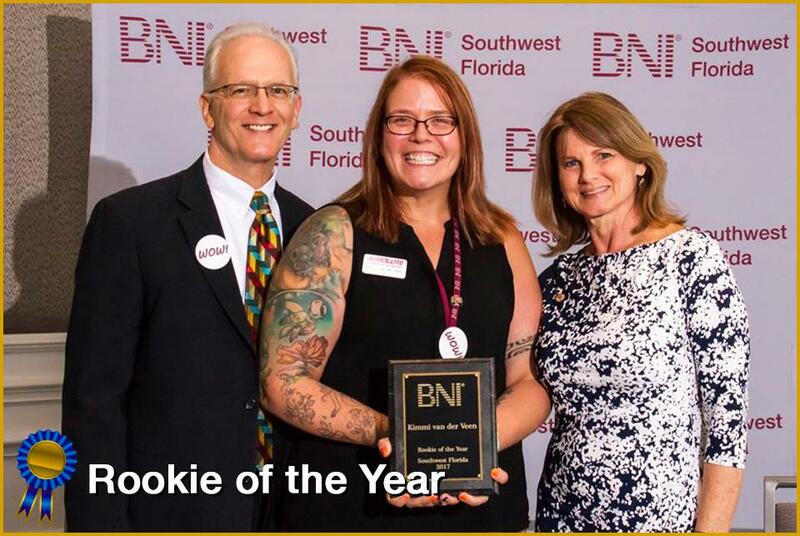 The awards were based on the following: Submitting reports, renewals and applications to the regional office in a timely and effective manner, communicating effectively with the Regional Office and Director, entering the speaker rotation in BNI Connect and maintaining accurate records. Director Consultant Glenn Scharf with The Scharf Group and Ambassador Mary Taylor with Mary Kay Cosmetics announced the Nominees for Rookie of the Year as well as the winner. Each chapter submitted a name of a member who has been in the chapter for less than one year as Most Valuable Rookie. Their nominating committee made of up the President, Vice President, Secretary Treasurer and Membership Committee chose their nominees based on referrals given, visitors brought, willingness to serve and most importantly showing a Giver’s Gain attitude right from the first day. This year’s winner of the Rookie of the Year has raised the bar on what can be done in a short amount of time with persistence, tenacity and the right attitude. In just 42 weeks this member has brought 3 visitors and passed 70 referrals resulting in almost $38,000 in closed business for her members. She is extremely energetic, has a great attitude and is totally committed to her chapter doing 99 One to Ones during her time in the chapter. 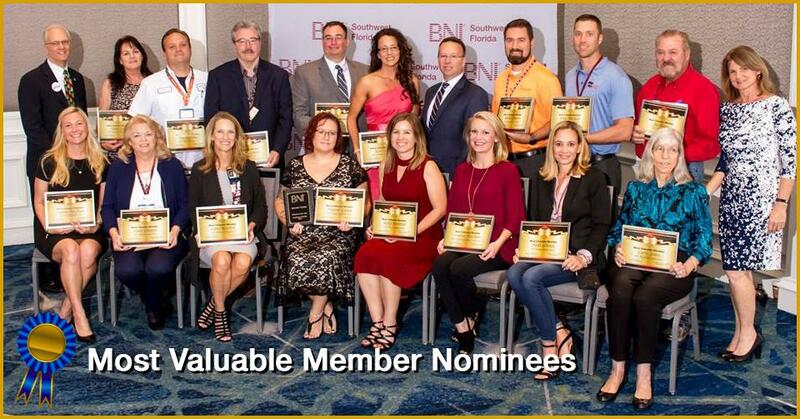 Director Consultant Robert Lauser with Grim Reaper Pest Control and Ambassador EJ Semmerling with Edward Jones announced Nominees for Most Valuable Member as well as the winner. Most of the nominees have served in a leadership position at some time during their membership. Many have been members for several years and still continue to pass referrals, bring visitors, mentor new members, serve their chapters and most importantly exude a Giver’s Gain® attitude. This year's Most Valuable Member has been applauded by the members of her chapter for her professionalism and positive attitude. 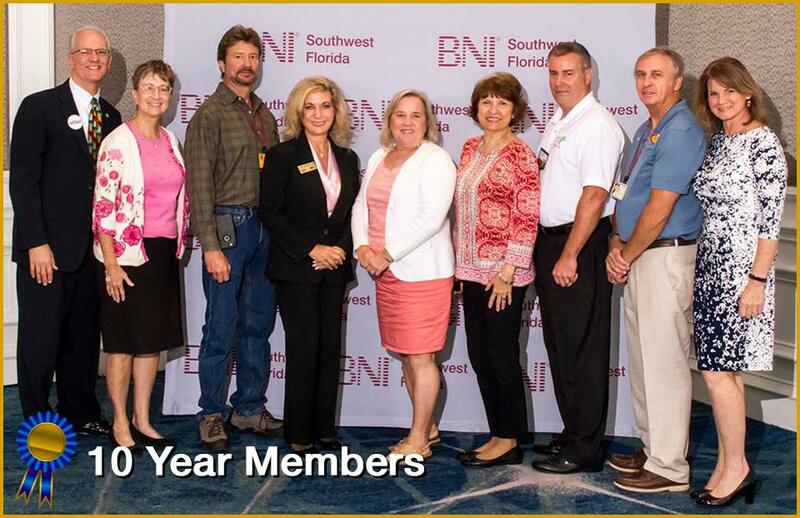 With a total 442 referrals which lead to over $186,190 in closed business, this member also brought 5 visitors to the chapter last year. She makes no excuses for being too busy to help fellow members and her chapter. Director Consultant Robert Lauser announced the nominees and winner of Most Improved Chapter. Criteria includes: upward movement in the Traffic Lights, implementing policies and procedures, member growth, increase in retention, and communication with directors. 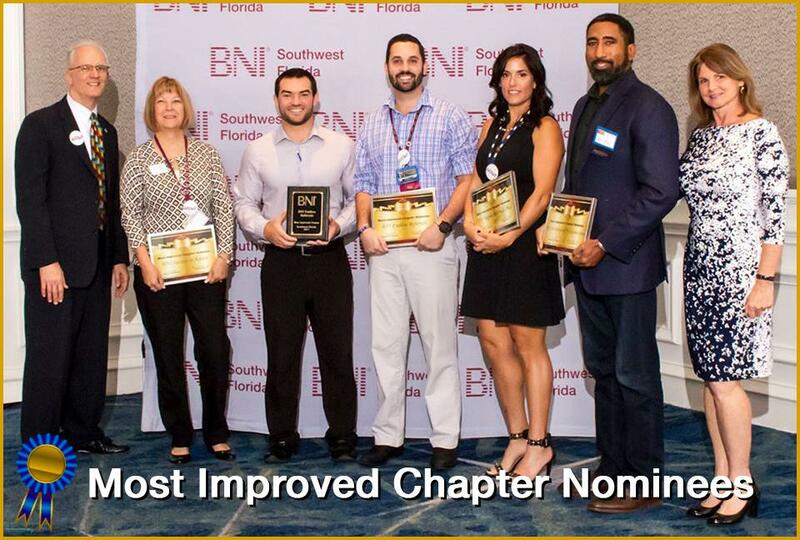 This year's Most Improved Chapter raised their retention from 46% to 54%, and they more than tripled the number of visitors throughout the year going from .81 to 2.63 visitors per week. October 1, 2016 they were 45 and red in the traffic lights, October 1 of this year they were 85 and green! They worked hard with their Director and it certainly paid off. They are full of enthusiasm and still focused on growth. This year's Chapter of the Year maintained Green status in the Traffic Lights 11 of the last 13 months. They increased members by 10, increased retention, referrals and conversion and reduced their absenteeism to 1.64%! This chapter lives the Giver’s Gain® philosophy, while having fun.